Since the Cisco ISR Series Routers have been announced end of life and end of sale, Cisco ISR G2 is being chosen by Cisco fans. 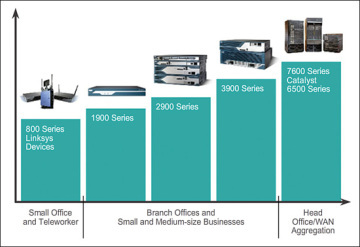 Why the Cisco ISR G2 is the better replacement for the Cisco ISR Series? Maybe the biggest difference between the original ISR Series and the new ISR G2 Series is the increase in throughput. When looking at the throughput figures of the ISR G2 series compared to the original ISR series, it’s hard to not be impressed by the ISR-G2 stats. In some cases, the total throughput is over 5x higher for the ISR G2 (Cisco 1941 vs. 1841 Router). However, when the environments where these routers are used is examined, we see a different picture emerge, one where even the much-slower 1841 is limited by the WAN connection rather than the router’s CPU. Take a simple example, a small branch office, in which there may be two WAN connections, a DSL or cable connection for internet use and a point to point T1 for connectivity back to the central office. At most, the total throughput needed here will be on the order of 10Mbps, still well within the capability of the Cisco 1841. Because of this, it’s important to perform a careful examination of what kind of WAN connectivity the router will be required to handle. Cisco 880 Series Routers, What Its Bright Points?